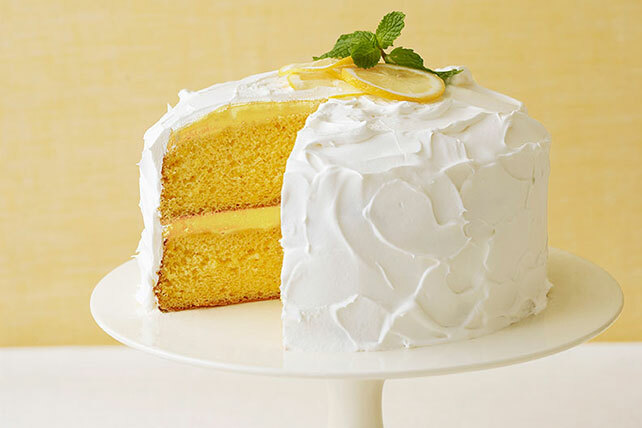 Lemon pudding creates a luscious cake filling, and frosting it with COOL WHIP couldn't be easier. Prepare cake batter and bake as directed on package for 2 (8- or 9-inch) round cake layers. Cool in pans 10 min. Remove to wire racks; cool completely. Beat pudding mixes and milk with whisk 2 min. (Pudding will be thick.) Stack cake layers on plate, spreading each with half the pudding. Garnish with lemon slices and fresh mint leaves just before serving. Bake cake in 13x9-inch pan; cool. Do not remove from pan. Frost cake with pudding, then Cool Whip.